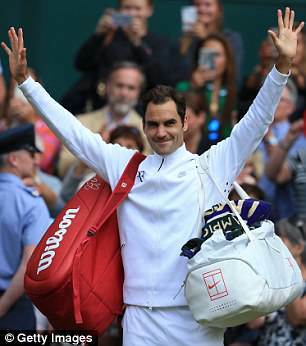 Reigning champion Roger Federer strode onto Wimbledon’s Centre Court with a new look on Monday afternoon after signing an astonishing £220million sponsorship deal with Uniqlo. 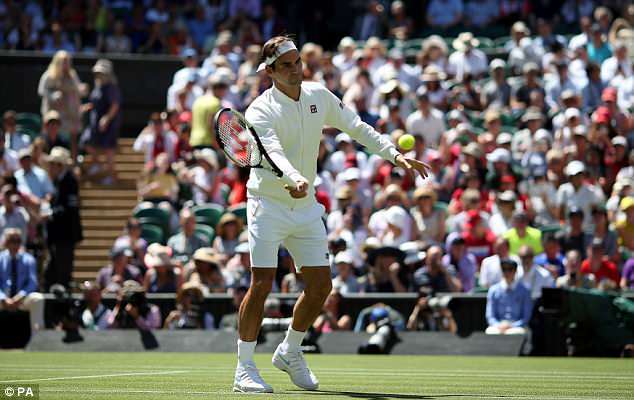 Eight-time All England Club champion Federer has agreed a decade-long, £22m-a-year partnership with the Japanese clothing firm. 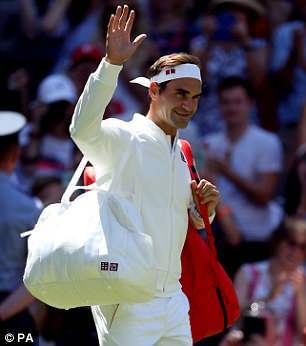 The Swiss star sported a Uniqlo-branded white jacket, top, shorts, socks and headband and carried a Uniqlo-branded white bag ahead of his match against Dusan Lajovic. 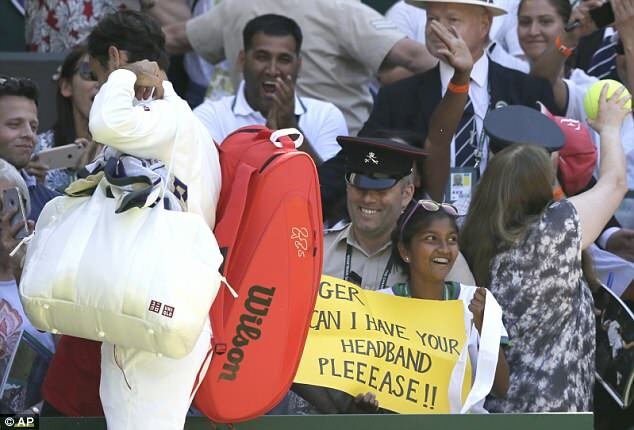 However Federer’s new clothing and baggage range is not available to buy in the chain’s shops and a spokesman was unable to say how much it might one day cost. 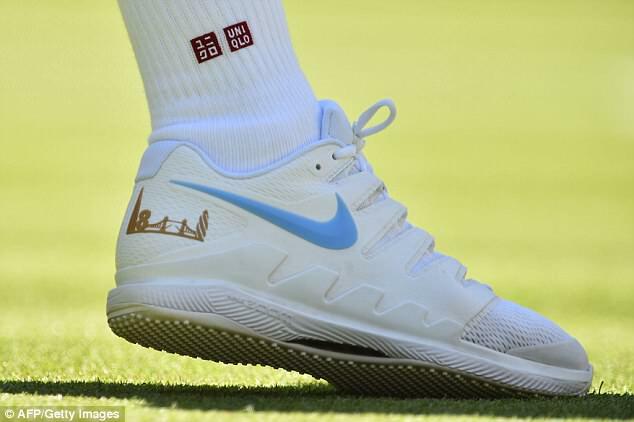 The Japanese firm do not make tennis shoes either and so Federer wore Nike trainers. 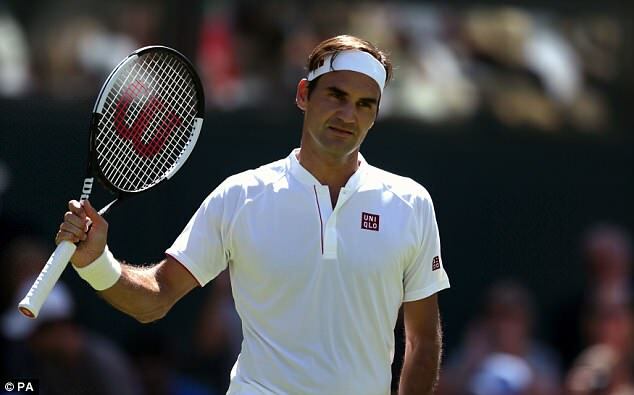 Last month Federer confirmed that his long-standing contract with Nike came to an end in March amid rumours he was poised to agree a £22million-a-year, decade-long deal with Japanese clothing firm Uniqlo. Stand-up collar white shirt with burgundy lines on the bottom of the sleeves and on the front. 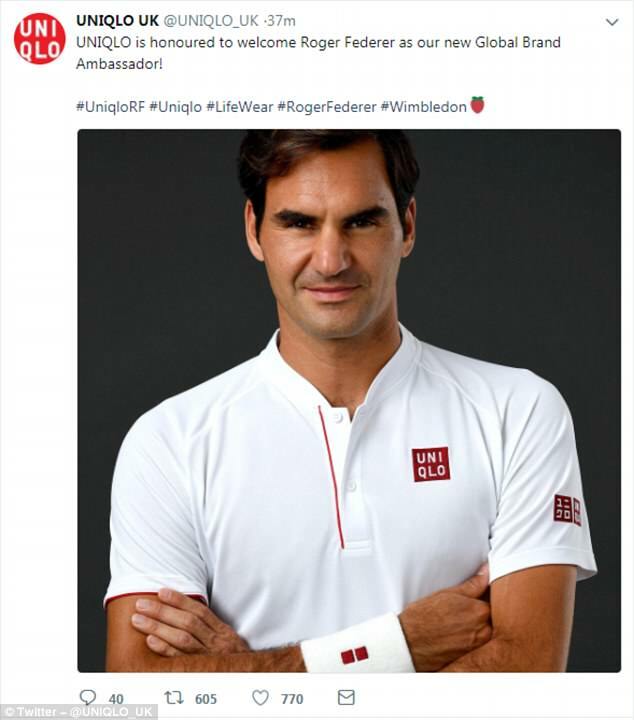 Uniqlo logo on the front and left sleeve. White shorts with burgundy lines down either side. Dry Ex material and breathable mesh used to limit sweat. 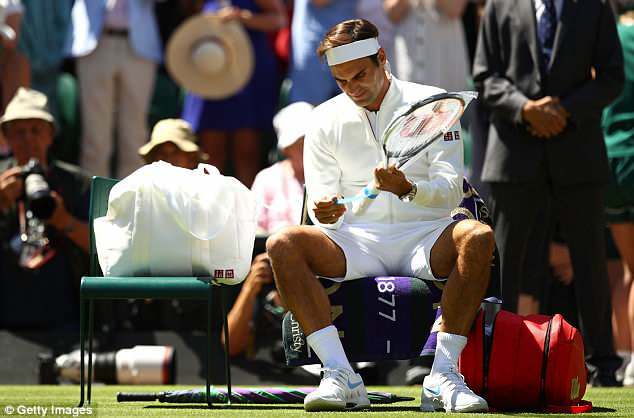 The 36-year-old winner of a record 20 career Grand Slams had worn Nike his entire career and the American company still owns the trademark ‘RF’ logo. 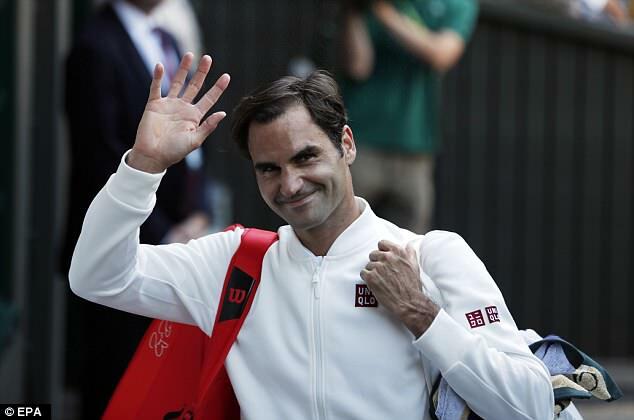 Tadashi Yanai, Uniqlo founder and chairman, said: ‘Mr Federer is one of the greatest champions in history; my respect for him goes beyond sport. ‘Our partnership will be about innovation on and off court. We share a goal of making positive change in the world, and I hope together we can bring the highest quality of life to the greatest number of people. Federer added: ‘I am deeply committed to tennis and to winning championships. But like Uniqlo, I also have great love for life, culture and humanity. 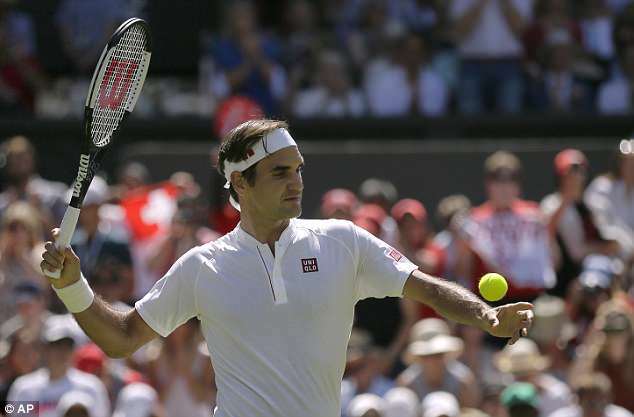 Federer was keen to play down the new deal at the Stuttgart Open. 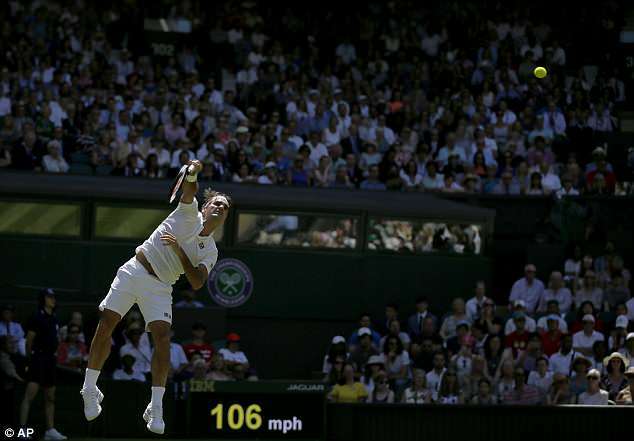 His attire at the grass-court tournament on Monday has confirmed his new deal. 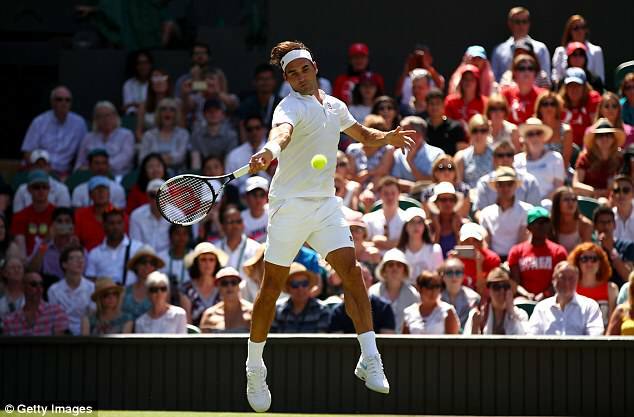 Federer breezed past first round opponent Lajovic in straight sets, winning 6-1, 6-3, 6-4. 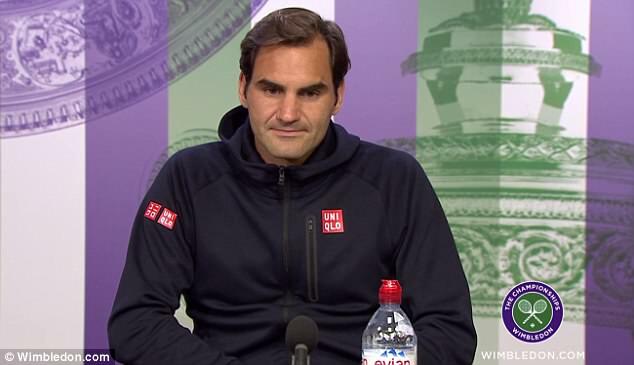 In his post-match press conference he wore a Uniqlo-branded hoody and said: ‘I was excited to wear Uniqlo today. ‘I must tell you, it’s been a long time coming. I felt very good out there. It’s also crucial to play well, so it was helpful. ‘The RF logo is with Nike at the moment, but it will come to me at some point. ‘I hope rather sooner than later, that Nike can be nice and helpful in the process to bring it over to me. It’s also something that was very important for me, for the fans really. ‘Look, it’s the process. But the good news is that it will come with me at one point. They are my initials. They are mine. The good thing is it’s not theirs forever. In a short period of time, it will come to me. ‘Obviously we also need to figure out with Uniqlo when at one point we can start selling clothes for the public as well. All this has just gotten underway. We’re hopeful the beginning of next year people can also start buying my stuff.